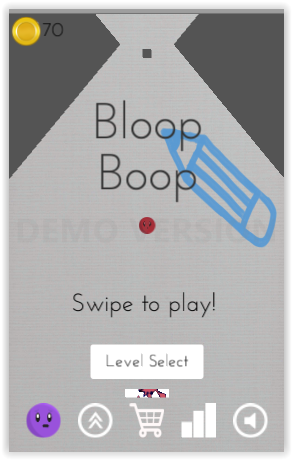 Bloop boop is a 2D physics based arcade game for the android phone, the game has a simple game play loop where the player swipes the screen to create platforms. These platforms then "boop" the players avatar the "Bloop" and they control the Bloop in this way through levels trying to get as short a time as possible on each level. Levels consist of preset hazards, powerups and coins. The hazards can consist of any number of things from a rotating object and moving walls to puzzles that make the player think outside the box in order to proceed. The powerups are things that help the player through these hazards from a simple bounciness increase, to an extra set out platforms to stop the bloop falling off screen. The player collects coins on their way through these levels and can use these coins to purchase upgrades for their bloop, or to purchase new bloops with different effects, colours and personalities. The player can return to previously played levels in order to get more coins to buy that bloop variant or upgrade they may need to proceed further on, or if the player wishes they make make a smaller purchase that will give them a large amount of coins this also disables in app purchases. 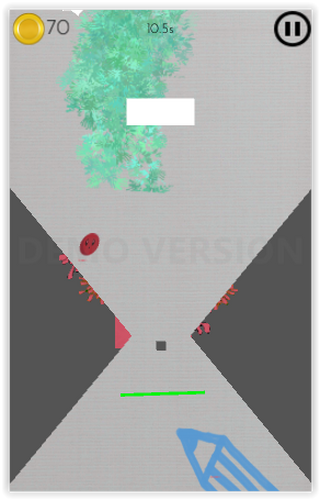 As the player boops their way through the level the bloops colour will change depending on what bloop they have selected as well as what powerup the players have picked up, this colour will bounce over the level and splatter over objects and explode if the player dies or finishes the level. After completing a level the player may choose to proceed to the next level or if they are especially proud of the time they got on that one specific difficulty level then they can share this time to facebook to show their friends or they may check the highscores to see where they stand on a global scale. After doing this the player can proceed to the next level and this will continue through 50 pre made levels. These levels will take on a simple get to the top setting and will vary in difficulty and in length, some can be completed with ease using the standard bloop. Others the player may need to invest in a variant or upgrades in order to proceed through it. The player can use their own strategy of blooping their boop, this can include creating platforms above and below the player in order to achieve a larger bounce. Or maybe upgrading and playing with one specific bloop as they have more success using this rather than the others. However this is wholly up to the player and they may choose to play the game upgrading or buying whichever bloop they wish. The game takes inspiration from a number of recent mobile games namely Doodle Jump, in the beginning stages of development the idea was to create a doodle jump with physics. The game itself is not endless and instead features levels, however endless mode was tested and may be reimplemented in a future update. The target market for this game is your average commuter between the ages of 30-55 and the mechanics reflect this as they can be played on a train or bus with ease using one hand. We are also targeting the younger generation of gamers of school kids from the ages 13-20, this is because the theme of the game appeals to a wide enough audience and the game play is easy enough to learn but hard enough to master. The theme of the game takes on a light hearted colourful palette with the idea of the bloop being a "ball of fluid" which will splatter and morph as the player boops it through the level. This is reflected throughout the game play and in the ui and menus. The audio of the game will reflect this theme with there being emphasis on the splattering of fluid and booping sounds of the players bloop. Click download (you may need to allow popups). This will take you to the google play beta where you can download the game.